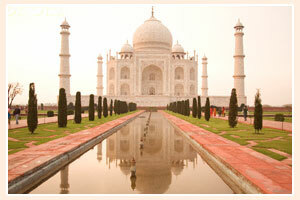 Taj Mahal, the symbol of eternal love is located in the city of Agra, in Uttar Pradesh. The Taj is one of the major tourist attraction places because of its beauty and great architecture. It is one of the Seven Wonders of the World. The monument was built by the Mughal Emperor Shah Jahan for his beloved wife Arjumand Bano Begum, famous as Mumtaz Mahal. The construction work of the Taj started in 1631 A.D and got completed by 1654 A.D. The construction of this masterpiece took 22 years and around twenty thousand laborers were deployed to work on it. The monument presents a finest example of Mughal architecture, a style that combines elements of Indian and Persian architectures. It’s a unique piece of art made up of white marble and glorifies true love.